I must admit, I was totally unfamiliar with William Shakespeare’s play The Two Gentlemen of Verona before attending opening night of IRT’s production, which opens their 2014-15 season. I have since learned that this comedy is considered by many to have been the bard’s first play or at least one of the first. If that is so, he certainly stepped off on the right path. As performed here by this genuinely expert company of actors and technicians, it is a wondrous creation that has made this play move to near the top of my list of favorite Shakespeare plays. 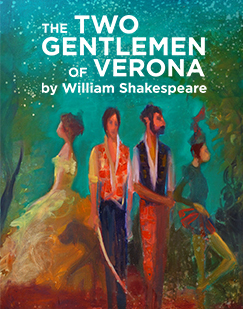 Working with themes of foolishness in love, friendship, and infidelity, the bard’s “two gentlemen in Verona” are Proteus, a love-addled young man, and his great friend, Valentine, a young man with a much sharper vision of the world with regard to amour. Valentine at first chides Proteus for his blindness about love, Proteus being totally taken by the elegant Julia, whom he pledges his heart to. The men separate and Valentine, in Milan now, meets his own true love in the Duke’s beautiful daughter Silvia. The plot thickens when Proteus is sent to the court in Milan by his father, ripping him away from his Julia. His deep love proves frail however, as he meets Valentine’s Silvia and immediately sheds his Julia and his Valentine for a chance to love her. These main characters are exquisitely performed by four engaging actors and actresses, three of whom are making their IRT debuts. Chris Bresky is the overtaken-by-love Proteus, whom he skillfully embodies with fidelities at first and failures of his nature at the end. This is a complex, selfish man and Bresky brings him to life with clear, identifiable traits. Charles Pasternak’s Valentine seems unfailingly true, to friends, to love and to himself. Pasternak’s Shakespearian training shines through in a sparkling performance full of nuance and understanding. Lee Stark (the one returning performer in this foursome) plays out a role full of many emotions – from her thrill of loving Proteus, to her great suffering as she learns of his betraying ways. Ms. Stark is lovely and funny in the early stages of her performance and is endearing and heart-breaking as she loses her love. Ashley Wickett brings Silvia to life with a beautiful portrayal – her character being as true to herself as her Valentine is. Doubling as Julia’s cheeky servant Lucetta, Ms. Wickett earns high regard for both of her performances. In supporting roles, Scot Greenwell is completely wonderful as Valentine’s man-servant, Speed. 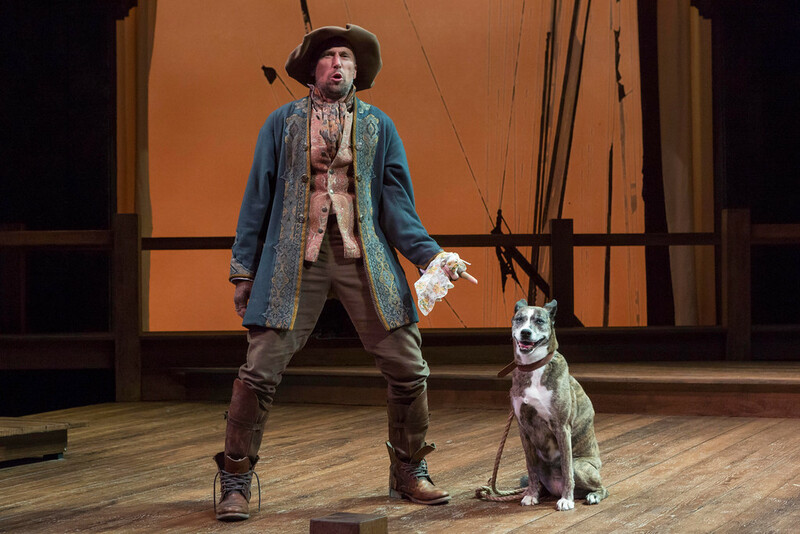 Matching him turn for turn is Ryan Artzberger as Proteus’s man Launce, who with his doggy companion, Crab – played with charming skill by the undaunted Jenna – steals every scene they are in. Robert Neal is strong in the masterly roles of Duke of Milan and Proteus’s father Antonio; and Matt Holzfeind is spot-on as the dandified Thurio, a man who is wooing Sylvia. Ryan Artzberger as Launce cavorts with Jenna as Crab in “The Two Gentlemen of Verona” at IRT. A remarkably adaptive set by Robert Mark Morgan, brilliant costumes by Dorothy Marshall Englis, a fine sound design by Andrew Hopson and adroit lighting by Michael Lincoln combine to complete director Tim Ocel’s intelligent and ever-forward-moving vision of this play. For someone like myself – having a certain amount of experience with Shakespeare’s works as an actor and as an audience member – that is to say, with limited but sufficient understanding of the sometimes difficult language and story-lines – Mr. Ocel’s direction style leads one to a better understanding and to a completely fulfilling experience. I thank him for that. 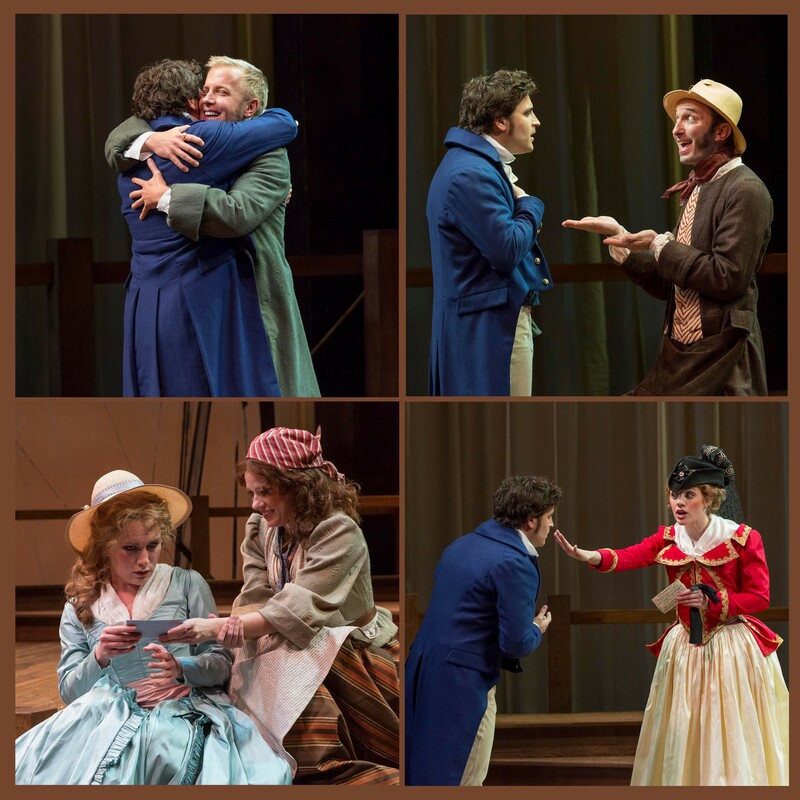 The Two Gentlemen of Verona continues on IRT’s OneAmerica Stage through October 19th. Information about tickets and play dates can be found at http://www.irtlive.com or by calling the IRT box office at 317-635-5252. Season tickets are still available for the theatre’s upcoming season.